Growing up on a farm, Dr. Hale made the most of outside activities like riding motorcycles, three-wheelers and more. With this fun came a neck injury that first caused headaches, then migraines. Dr. Hale’s mother brought him to the chiropractor, which was the only avenue that gave him relief. His father and uncle saw success with the chiropractor as well, and it made an impression on him. When he was only a semester shy of graduating with a degree in mechanical engineering, Dr. Hale decided to change paths. He went back to what his original career idea was: to become a doctor. With a natural approach that didn’t involve surgery and an interest in the biomechanical aspects of the spine and body, chiropractic was the perfect choice. Dr. Hale attended Parker University to achieve a Doctor of Chiropractic. While there, he discovered an unquenchable thirst to learn more about the chiropractic philosophy that the body is a self-healing entity. That philosophy became his guide in developing an effective approach to the chiropractic adjustment, creating changes using just his hands. During his years in chiropractic college, Dr. Hale met his wife, who is also a chiropractor. They have a total of 16 chiropractors in their extended family. 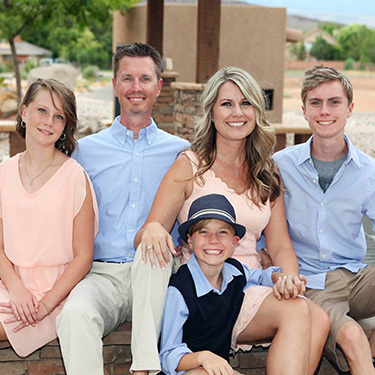 In their spare time, they and their three children love making the most of the gorgeous great outdoors in St. George. Together, they like to spend time outside mountain biking, wakeboarding, wake surfing and hiking. Dr. Hale and his wife are also involved with their kids’ mountain bike racing team. If you’re ready to discover what your body is capable of, contact our team today! We’re pleased to offer complimentary consultations.